The kettlebell or girya (Russian: ги́ря) is a cast-iron or cast steel weight (resembling a cannonball with a handle) used to perform ballistic exercises that combine cardiovascular, strength and flexibility training. They are also the primary equipment used in the weight lifting sport of girevoy sport. 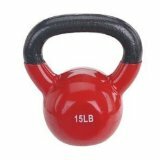 Russian kettlebells are traditionally measured in weight by pood, which (rounded to metric units) is defined as 16 kilograms (35 lb). cloud hosting info .